This week, quite a bit of the metal siding on the upper section of the lower building has been installed. Brick is going up on the exterior chapel walls, and window frames are being installed on the upper level and the back of the adult space in the new building. This window framing must happen before the window glass, of course, and that must happen before the drywall – so this critical path progress is very important to our ultimate move-in date of sometime this fall. 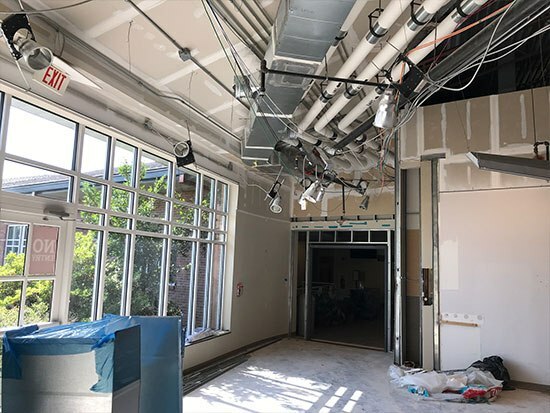 In the renovation section, HVAC ducts and electrical wiring are being re-positioned to match the needs of the new layout of space. Plumbing has been installed for the future water fountain near the bathroom at the top of the stairs. The openings in the wall that formerly were doorways to the now-demolished offices have been filled in with drywall, and framing has been put in place for the new doorways. Soon, when those doors are installed, the remaining offices should be a bit quieter, which will be good! It may seem a bit frivolous to pray for good weather, but we really do need dry days and nights for the next four weeks or so – long enough to get most of the remaining site work done in the pond area as well as around the new building. We hope to see some major progress in the next week or so as the grading is tuned up, the fire lane behind the sanctuary is finished, and the pond is finished and the plantings that will stabilize its banks are installed.